Who's that hiding amongst the leaves? Why, it's my newest friend, Dot. Isn't she a cutie? She's come all the way from Greece to keep me company while I craft. Aww...isn't that nice of her? Before Canada Post decided to go on a rotating strike, I had participated in a few swaps on Ravelry. The most recent swaps being a Caffeine Addicts swap (yummy coffee and treats with equally nummy yarn!) and a Stuffed Envelope swap. The latter is how I got Dot. The envelope swap was a new one to me, since previous swaps that I've done have all been theme-oriented and getting to know your swap partner. The envelope one was all about how much can you stuff into a 6"x9" envelope to a person that has no idea who they are getting their package from. Sounds fun, doesn't it? I had a crap-ton of fun putting my envelope together, unfortunately I totally forgot to take a photo of my package before I mailed it off but trust me when I say I had to encase the entire envelope in packing tape cause I couldn't get the flap to close! I was really nervous that my secret swap partner wouldn't like what I had picked out, but in the end she loved everything and left quite the enthusiastic thank you post on the swap thread. And then my adorable little Dot. 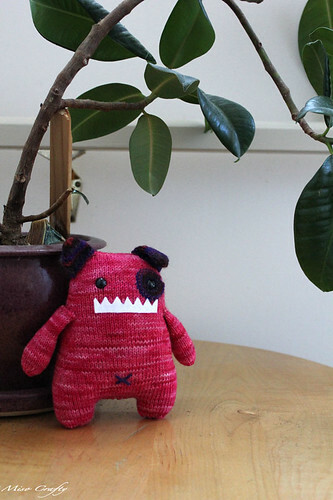 My swap partner made Dot from a Rebecca Danger pattern (she's Dot the Dress Up Box Monster, for those of you who want one), from the book The Big Book of Knitted Monsters. 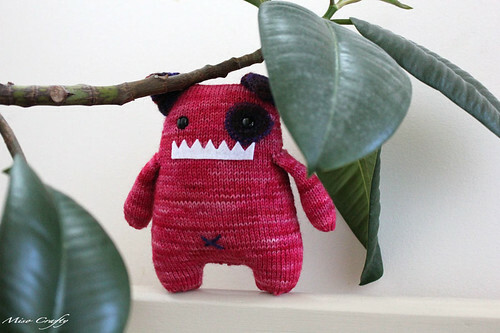 I absolutely love Rebecca Danger monsters and have always wanted to knit a bunch. But I don't. Cause of my dislike of seaming things. Even though the seams would be quite small, I still avoid hand sewing at all costs. A toy maker, I am not. So I didn't think I would ever get a Danger monster to call my own. 'Til now, that is. And she's even pink! Bonus points to my swappie partner for that! Dot currently lives in my sewing room, guarding my fabric stash and some rogue skeins of yarn. I don't dare let her out when the Munchkin is around, since he's a toddler and pretty much all toddlers think everything belongs to them. And Dot is definitely mine. She makes me smile every time I turn on my sewing closet light.